The development of controlled microstructures is a primary goal in designing novel materials with unique thermal, mechanical, electromagnetic, and other properties. 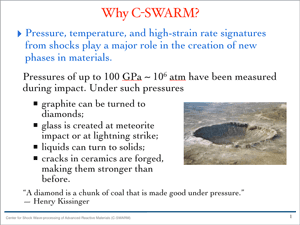 The main mission of the Center for Shock Wave-processing of Advanced Reactive Materials (C-SWARM) is to predict shock conditions under which new materials can by synthesized. This processing generates high temperature and pressure that can lead to new materials being created. Such material transformations are governed by a plethora of physics, mechanics, and chemistry that test our understanding of microstructure-property-relations and our capacity to tune materials at will. The goal of C-SWARM is deployment of verified and validated computational simulations to predict the properties and dynamics of complex systems, with quantified uncertainty. Heterogeneous reactive materials (HRMs) are important, complex, and perhaps one of the best examples of a multiscale problem where Exascale computational resources can have a transformative impact. These materials acquire enhanced properties after shock wave-processing that are difficult to produce using conventional manufacturing. Under such conditions, the material undergoes drastic changes in its physical behavior primarily due to very large pressures and strain rates. C-SWARM represents a coordinated effort combining multi-resolution simulations, a transformative computational execution model (ParalleX), and experiments to analyze the chemo-thermo-mechanical response of HRMs. Polydisperse materials with different chemical composition and disparate thermo-mechanical behavior exhibit a complex response that is difficult to capture using conventional theories. To model such materials, C-SWARM employs an adaptive multiscale strategy that solves in adaptive fashion phase-averaged macro-continuum equations using an Eulerian algorithm with constitutive equations locally provided by well-resolved micro-continuum simulations of the multi-phase mixture using a Lagrangian algorithm. C-SWARM takes advantage of the instantaneous localization knowledge of those regions where full simulations are necessary. The macro- and micro-continuum codes will utilize an advanced execution model, ParalleX. ParalleX enables data-mining of runtime information to dynamically adapt the codes’ demands to resource availability. Furthermore, Active System Libraries will be implemented to ensure that the macro- and micro-continuum algorithms can be represented in an effective and hardware-independent fashion. The integrated V&V/UQ program provides a platform for computational model verification, validation and propagation of uncertainties. The emphasis of C-SWARM is on quantifying the predictive ability of the multiscale simulations in an efficient manner. The key component is a series of carefully co-designed expriments and data-driven simulations (with quantified uncertainties) to enable meaningful and rigorous comparison of simulation predictions with experimental results.